13/55 Reagen Sulewski Arguably the most eye-opening of this year's polemic documentaries, if a bit unfocused. 15/48 Les Winan Well-made and thought-provoking... Confirmed (along with the book Fast Food Nation) that I will never eat McDonald's again. 17/126 Kim Hollis Funny, thought-provoking and brilliant. The rules are pretty simple. 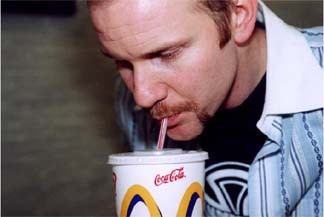 Director Morgan Spurlock ate only McDonald’s food for 30 days. He could only eat what was on the menu, he had to eat everything on the menu at least once, and if asked if he wanted to super size it, he had to say yes. He also cut down his exercise level to the national average level, all the while employing a team of physicians to track the effects this diet had on his body. While it may be a tongue-in-cheek (or burger in mouth) approach, the subject covered in this documentary is very serious. Obesity is quickly becoming the biggest health problem in the United States. Whether fast food restaurants are to take the blame for this problem is being put to the test in the courts with several suits being levied against them. And regardless of public culpability, Spurlock can already claim a small victory as McDonald's has eliminated Super Sizing from their restaurants since the film captured audience attention at Sundance. Of course, where personal responsibility and an increasingly sedentary lifestyle comes into play is another aspect that needs to be taken into account.